Abstract: Publication date: Available online 24 April 2019Source: Advances in Space ResearchAuthor(s): Mohammad Maleki, Jalal Amini, Claudia Notarnicola The purpose of this study is to estimate the surface roughness (rms) using TerraSar-X data in HH polarization. Simulation of data is carried out at a wide range of moisture and roughness using the Integral Equation Model (IEM). The inversion method is based on Multi-Layer Perceptron neural network. Inversion technique is performed in two steps. In the first step, the neural network is trained using synthetic data. The inputs of the first neural network are the backscattering coefficient and incidence angle, and the moisture is the output. In the next step, three neural networks are built based on a prior and without prior information on roughness. The inputs of three neural network are backscattering coefficient, estimated moisture in the first step and incidence angle and the roughness is output. The validation of the proposed methods is carried out based on synthetic and real data. Ground roughness measurements are extracted from Digital Terrain Model (DTM) using the fractal method. The accuracy of moisture from synthetic data is 6.1 vol. % without prior information on moisture and roughness. The roughness (rms) accuracy of synthetic datasets is 0. 61cm without prior information and is 0.31cm and 0.38cm for rms lower than 2cm and rms between 2 and 4 cm, with prior information on roughness. The result's analysis of the simulated data showed that the prior information on roughness strongly improves the accuracy of roughness and moisture estimates. The accuracy of rms estimates for the TerraSar-X image in the HH polarization is about 0.9 cm in the case of no prior information on roughness. The accuracy improves to 0.57cm for rms lower than 2cm and 0.54cm for rms between 2 and 4 cm with prior information on roughness. An overestimation of rms for rms lower than 2cm and an underestimation of rms for rms higher than 2cm are observed. The results of the accuracy of the synthetic and real data showed that the X band in HH polarization has a very good potential to estimate the soil roughness. Abstract: Publication date: Available online 24 April 2019Source: Advances in Space ResearchAuthor(s): Paul Sava, Erik Asphaug The interior structure of small planetary bodies holds clues about their origin and evolution, from which we can derive an understanding of the solar system’s formation. High resolution geophysical imaging of small bodies can use either radar waves for dielectric properties, or seismic waves for elastic properties. Radar investigation is efficiently done from orbiters, but conventional seismic investigation requires landed instruments (seismometers, geophones) mechanically coupled to the body.We propose an alternative form of seismic investigation for small bodies using Laser Doppler Vibrometers (LDV). LDVs can sense motion at a distance, without contact with the ground, using coherent laser beams reflected off the body. LDVs can be mounted on orbiters, transforming seismology into a remote sensing investigation, comparable to making visual, thermal or electromagnetic observations from space. Orbital seismometers are advantageous over landed seismometers because they do not require expensive and complex landing operations, do not require mechanical coupling with the ground, are mobile and can provide global coverage, operate from stable and robust orbital platforms that can be made absolutely quiet from vibrations, and do not have sensitive mechanical components.Dense global coverage enables wavefield imaging of small body interiors using high resolution terrestrial exploration seismology techniques. Migration identifies and positions the interior reflectors by time reversal. Tomography constrains the elastic properties in-between the interfaces. These techniques benefit from dense data acquired by LDV systems at the surface, and from knowledge of small body shapes. In both cases, a complex body shape, such as a comet or asteroid, contributes to increased wave-path diversity in its interior, and leads to high (sub-wavelength) imaging resolution. Abstract: Publication date: 15 May 2019Source: Advances in Space Research, Volume 63, Issue 10Author(s): Yuan Xiao, Yan Su, Shun Dai, Jianqing Feng, Shuguo Xing, Chunyu Ding, Chunlai Li The Lunar Regolith Penetrating Radar (LRPR) is an Ultra-Wideband (UWB) array-based Ground penetrating radar (GPR) onboard the lander of Chang’e-5 (CE-5) mission. The primary scientific objectives of the LRPR are to probe the thickness and structure of lunar regolith of the landing site, and support the drilling and sampling process. In order to evaluate the performance of the LRPR, a series of ground experiments are performed using the LRPR prototype mounted on a CE-5 lander model. The performance of the LRPR is evaluated by comparing the experimental data with the simulated data. Data processing and imaging method are verified, and the interferences from the lander and other aspects are analyzed. The results of the ground experiments and simulation demonstrate that the LRPR is able to meet the design requirement of 2-m detection depth. They also indicate that the upper and lower interfaces of the stratified structure in the lunar regolith can be well distinguished by the LRPR when the dielectric constant difference is greater than 0.3, and the imaging effect of the location under the dense antennas is better than that of other positions. However, the identification capability of the LRPR to the independent blocky objects is relatively poor mainly due to the clutters caused by the lander, the sparsity of the antenna elements compared to the size of the basalt block, the limited aperture of the antenna array, and the tail of the transmitted waveform. Abstract: Publication date: 15 May 2019Source: Advances in Space Research, Volume 63, Issue 10Author(s): V.A. Kotov Time variations of the magnetic field of the Sun, seen as a star (the data 1968–2018, with more than 27 thousand daily measurements of the solar mean magnetic field), allowed to specify the rotation period of the gravitating solar mass: 27.027(6) days, synodic. This indicates a presumably unknown physical connection between motions of the Sun and the Earth: in the course of a year our star accomplishes nearly 27 half-revolutions, while the planet itself performs an identical number of its spinnings during one complete axial revolution of the Sun. True origin of this strange Sun–Earth resonance is unknown, but it is supposed the phenomenon might be caused by slight coherent perturbations of gravity within the solar system. Abstract: Publication date: 15 May 2019Source: Advances in Space Research, Volume 63, Issue 10Author(s): Mahshid Soleymani, Mahdi Fakoor, Majid Bakhtiari In this paper, a general new methodology is presented for the orbital reconfiguration of satellite constellations on the basis of Lambert targeting theorem. In view of the cost and risk reduction, it is very important to consider the problem of satellite constellation reconfiguration with the two constraints of overall mission cost minimization and the desired final configuration. Hence, the dependent non-simultaneous deployment approach is proposed to minimize overall fuel cost. Despite the fact that the satellites deploy in a non-simultaneous manner, supplementary phasing maneuvers on the target orbital pattern to achieve the desired orbital configuration are avoided. Moreover, a novel idea is presented to optimize the flight of satellites, which plays an important role in complying with the constraint of overall fuel cost minimization as much as possible. In order to achieve the global optimal solution of the satellite constellation reconfiguration problem, the efficient hybrid Particle Swarm Optimization/Genetic Algorithm (PSO/GA) technique, is implemented. Finally, to indicate the superiority of the presented method, a comparison to the simultaneous maneuver viewpoint is made on a number of representative cases. The obtained results imply significant reduction of reconfiguration costs by employing the proposed method. Abstract: Publication date: 15 May 2019Source: Advances in Space Research, Volume 63, Issue 10Author(s): Darin Koblick, Shujing Xu A novel semi-analytic approach is developed to determine the minimum ΔV for a two-impulse rendezvous and validated both empirically and analytically. A previously published closed-form ΔV estimate and the Lambert minimum energy transfer is used to establish upper and lower bounds of the minimum ΔV transfer between two orbits. These bounds, in conjunction with the bisection method, operate on a nonlinear radical cost function to guarantee linear convergence. This approach has several real world applications including a low earth orbit (LEO) to highly elliptical orbit (HEO), and a HEO to retrograde geosynchronous orbit transfer. The minimum ΔV estimates are better than those reported in the existing literature, while run times improved as much as two orders of magnitude over a fixed time Lambert solver. All singularity cases were addressed such that any orbital geometry, including Hohmann and radial elliptic transfers, converged to the global minimum ΔV. This approach will work for both coplanar and non-coplanar 3D geometries for any orbit type. Abstract: Publication date: 15 May 2019Source: Advances in Space Research, Volume 63, Issue 10Author(s): Enton Bedini The Rodalquilar epithermal quartz-alunite gold deposits that occur within the Rodalquilar caldera complex in southeast Spain, are associated with a pronounced hydrothermal alteration of the country rocks. The hydrothermal alteration zones that are exposed on the surface consist of the vuggy silica zone, the advanced argillic alteration zone, the intermediate argillic alteration zone, the propylitic alteration zone, and a second stage supergene acid sulfate alteration. High spatial resolution multispectral imagery recorded by the WorldView-3 satellite was used in this study to map the spatial distribution of the main alteration minerals in the Rodalquilar caldera complex. Thermal infrared (TIR) data of the ASTER satellite were used to detect the quartz-rich zones. The analysis of the Rodalquilar WorldView-3 data was based on the Adaptive Coherence Estimator (ACE), a partial unmixing algorithm. The ACE processing accurately mapped the spatial distribution of alunite, kaolinite, illite and goethite. Alunite is abundant in the vuggy silica and advanced argillic alteration zones, and in the second stage supergene acid sulfate alteration. Kaolinite is predominant in the intermediate argillic alteration zone. Illite is abundant in the outer parts of the intermediate argillic alteration zone. Goethite image maps gossans that mainly occur in the vuggy silica and advanced argillic alteration zones, and in the areas characterized by the second stage supergene acid sulfate alteration. The detection of quartz-rich zones from the ASTER TIR data complemented the WorldView-3 mapping results. The study shows the efficiency of high spatial resolution multispectral remote sensing imagery recorded by the WorldView-3 satellite for district-level mineral exploration studies. Abstract: Publication date: 15 May 2019Source: Advances in Space Research, Volume 63, Issue 10Author(s): Shuangcheng Zhang, Kai Liu, Qi Liu, Chenglong Zhang, Qin Zhang, Yang Nan Global Navigation Satellite System multipath reflectometry (GNSS-MR) technology has great potential for monitoring tide level changes. GNSS-MR techniques usually extract signal-to-noise ratio (SNR) residual sequences using quadratic polynomials; however, such algorithms are affected considerably by satellite elevation angles. To improve the stability and accuracy of an SNR residual sequence, this study proposed an SNR signal decomposition method based on empirical mode decomposition (EMD). First, the SNR signal is decomposed by EMD, following which the SNR residual sequence is obtained by combining the corresponding intrinsic mode function with the frequency range of the coherent signal. Second, the Lomb–Scargle spectrum is analyzed to obtain the frequency of the SNR residual sequence. Finally, the SNR frequency is converted into the tide height. To verify the validity of the SNR residual sequence obtained by EMD, the algorithm performance was assessed using multigroup satellite elevation angle intervals with measured data from two station, SC02 in the United States and RSBY in Australia. Experimental results demonstrated that the accuracy of the improved algorithm was improved in the low-elevation range. The improved algorithm demonstrated high monitoring accuracy, and the effective number was not less than 80% of the total in SC02, which means it could effectively describe the trend of the tide with accuracy of approximately 10 cm, meanwhile, the RMS error of RSBY could be reduced by 30 cm, to the maximum extent. The EMD method effectively expands the range of available GNSS-MR elevations, avoids the loss of effective information, enhances considerably the utilization rate of GNSS data, and improves the accuracy of GNSS-MR tide level monitoring. Abstract: Publication date: 15 May 2019Source: Advances in Space Research, Volume 63, Issue 10Author(s): Abdollah Sheikhrahimi, Amin Beiranvand Pour, Biswajeet Pradhan, Basem Zoheir The Sanandaj-Sirjan Zone (SSZ) is considered as an important region for gold exploration in the western sector of Iran. Its mountainous topography and unpaved routes make its study challenging for researchers and raise the costs for mining companies strating new exploration plans. Gold mineralization mainly occurs as irregular to lenticular sulfide-bearing quartz veins along shear zones in deformed mafic to intermediate metavolcanic and metasedimentary rocks. In this investigation, ASTER data are used for mapping hydrothermal alteration minerals and to better discriminate geological structural features associated with orogenic gold occurrences in the area. Image transformation techniques such as specialized band ratioing and Principal Component Analysis are used to delineate lithological units and alteration minerals. Supervised classification techniques, namely Spectral Angle Mapper (SAM) and Spectral Information Divergence (SID) are applied to detect subtle differences between indicator alteration minerals associated with ground-truth gold locations in the area. The directional filtering technique is applied to help in tracing along the strike the different linear structures. Results demonstrate that the integration of image transformation techniques and supervised classification of ASTER data with fieldwork and geochemical exploration studies has a great efficiency in targeting new prospects of gold mineralization in the SSZ. The approach used in this research provides a fast, cost-efficient means to start a comprehensive geological and geochemical exploration programs in the study area and elsewhere in similar regions. Abstract: Publication date: 15 May 2019Source: Advances in Space Research, Volume 63, Issue 10Author(s): Yang Yang, Yu Zheng, Wenkun Yu, Wu Chen, Duojie Weng GNSS reflectometry (GNSS-R) has been widely studied in recent years for various applications, such as soil moisture monitoring, biomass analysis, and sea state monitoring. This paper presents the concept of a novel application of using GNSS-R technology for deformation monitoring. Instead of installing GNSS on the deformation body to sense the movement, GNSS-R deformation monitoring system estimates the deformation from receiving GNSS signal reflected by the deformation body remotely. A prototype of GNSS-R deformation monitoring system has been developed based on GNSS software receiver technology. A 3D geometrical model of GNSS signal reflection has been used to reveal the relationship between the change of carrier phase difference and deformation. After compensating the propagation path delay changes caused by satellite movement, the changes in the remaining carrier phase difference are linked to the deformation. Field tests have been carried using the GNSS-R system developed and the results show sub-centimeter level deformation can be observed with the new technology. Unlike other GNSS deformation monitoring methods, GNSS-R receivers are not installed on the slope which makes this new technology more attractive. Abstract: Publication date: 15 May 2019Source: Advances in Space Research, Volume 63, Issue 10Author(s): Shambavi Ganesh, Ankita Pradhan, J. Indu The study investigates the evaluation and comparison of sampling error for the Global Precipitation Measurement (GPM) mission orbital data products by implementing a bootstrap technique over the two major basins in the Indian subcontinent i.e the Ganga and the Mahanadi basin. The relative sampling error evaluated over both the Ganges and Mahanadi basins showed commendable results thus giving the confidence to adopt the bootstrap technique to evaluate the sampling error. The region over India with large seasonal rainfall seems to have less sampling uncertainty and vice versa with some regions showing exceptions which might be due to the difference in precipitation variability and space-time correlation length. The scale dependence was verified for four grid sizes along with seasonal time scale. Results indicate that the relative sampling error estimates are inversely proportional to the scale of the grid size. The comparative study of evaluation of sampling uncertainty to different precipitation types resulted to have maximum sampling error in GPM Microwave Imager (GMI) in comparison to Dual Precipitation Radar (DPR) convective and DPR total precipitation. Thus, the comparable results of sampling uncertainty between the major basins in the Indian sub-continent provides the user a decision making criteria before utilizing the GPM orbital products in any applications. Abstract: Publication date: 15 May 2019Source: Advances in Space Research, Volume 63, Issue 10Author(s): Zhiliang Li, Xiaojiang Li A robust model and a Multi-objective Binary-encoding Differential Evolution (MBDE) algorithm are proposed in this paper for agile earth observation satellite proactive scheduling considering satellite resource failure and emergency task insertion. Firstly, considering that the reserved slack time in schedule can absorb uncertainties, two indicators are proposed: schedule profits and slack time, based on which, a robust model of proactive scheduling is established. Secondly, to solve the multi-objective model, solutions are represented via binary-encoding, mutation, crossover, and selection operators are re-designed, besides, an external archive update strategy is adopted to store elitist solutions in the evolution process, moreover, non-dominated Pareto set evaluation metrics are improved. Finally, computational results have demonstrated that, compared with NSGA-II and SPEA-2, the MBDE algorithm is able to obtain well-distributed solutions with good convergence more efficiently. The study can provide the method support for proactive scheduling of agile earth observation satellites. Abstract: Publication date: 15 May 2019Source: Advances in Space Research, Volume 63, Issue 10Author(s): F. Di Capua, L. Campajola, P. Casolaro, M. Campajola, A. Aloisio, A. Lucaroni, G. Furano, A. Menicucci, S. Di Mascio, F. Malatesta, M. Ottavi A new methodology for Total Ionizing Dose (TID) tests is proposed. It is based on the employment of an on-chip 90Sr/90Y beta source as alternative to standard methods such as 60Co gamma rays and electrons from LINAC. The use of a compact beta source for TID tests has several advantages. In particular, the irradiation of devices with more than one radiation source results in a better representation of the complex space radiation environment composed of several types, energies and dose-rates. In addition, the use of an easy handling beta source allows the irradiation of electronic devices without any damage to other auxiliary circuit. In this work, 90Sr/90Y beta source dosimetry and related radiation field characteristics are discussed in depth.In order to validate the proposed source for TID tests, a rather complex device such as the “SPC56EL70L5” microcontroller from ST-Microelectronics was exposed to 90Sr/90Y beta rays. The results of this test were compared to that of a previous test of another sample from the same lot with a standard gamma 60Co source. The electronic performances following the two irradiations have been found to be in excellent agreement, by demonstrating therefore the validity of the proposed beta source for TID tests. Abstract: Publication date: 15 May 2019Source: Advances in Space Research, Volume 63, Issue 10Author(s): Petro Abrykosov, Roland Pail, Thomas Gruber, Nassim Zahzam, Alexandre Bresson, Emilie Hardy, Bruno Christophe, Yannick Bidel, Olivier Carraz, Christian Siemes The state-of-the-art electrostatic accelerometers (EA) used for the retrieval of non-gravitational forces acting on a satellite constitute a core component of every dedicated gravity field mission. However, due to their difficult-to-control thermal drift in the low observation frequencies, they are also one of the most limiting factors of the achievable performance of gravity recovery. Recently, a hybrid accelerometer consisting of a regular EA and a novel cold atom interferometer (CAI) that features a time-invariant observation stability and constantly recalibrates the EA has been developed in order to remedy this major drawback. In this paper we aim to assess the value of the hybrid accelerometer for gravity field retrieval in the context of GRACE-type and Bender-type missions by means of numerical closed-loop simulations where possible noise specifications of the novel instrument are considered and different components of the Earth’s gravity field signal are added subsequently. It is shown that the quality of the gravity field solutions is mainly dependent on the CAI’s measurement accuracy. While a low CAI performance (10−8 to 10−9 m/s2/Hz1/2) does not lead to any gains compared to a stand-alone EA, a sufficiently high one (10−11 m/s2/Hz1/2) may improve the retrieval performance by over one order of magnitude. We also show that improvements which are limited to low-frequency observations may even propagate into high spherical harmonic degrees. Further, the accelerometer performance seems to play a less prominent role if the overall observation geometry is improved as it is the case for a Bender-type mission. The impact of the accelerometer measurements diminishes further when temporal variations of the gravity field are introduced, pointing out the need for proper de-aliasing techniques. An additional study reveals that the hybrid accelerometer is – contrary to a stand-alone EA – widely unaffected by scale factor instabilities. Abstract: Publication date: 15 May 2019Source: Advances in Space Research, Volume 63, Issue 10Author(s): Zheyao Xu, Yukun Chen, Zhexuan Xu The guidance and control strategy for spacecraft rendezvous and docking are of vital importance, especially for a chaser spacecraft docking with a rotating target spacecraft. Approach guidance for docking maneuver in planar is studied in this paper. Approach maneuver includes two processes: optimal energy approach and the following flying-around approach. Flying-around approach method is presented to maintain a fixed relative distance and attitude for chaser spacecraft docking with target spacecraft. Due to the disadvantage of energy consumption and initial velocity condition, optimal energy guidance is presented and can be used for providing an initial state of flying-around approach process. The analytical expression of optimal energy guidance is obtained based on the Pontryagin minimum principle which can be used in real time. A couple of solar panels on the target spacecraft are considered as obstacles during proximity maneuvers, so secure docking region is discussed. A two-phase optimal guidance method is adopted for collision avoidance with solar panels. Simulation demonstrates that the closed-loop optimal energy guidance satisfies the ending docking constraints, avoids collision with time-varying rotating target, and provides the initial velocity conditions of flying-around approach maneuver. Flying-around approach maneuver can maintain fixed relative position and attitude for docking. Abstract: Publication date: 15 May 2019Source: Advances in Space Research, Volume 63, Issue 10Author(s): Gefei Shi, Gangqiang Li, Zhanxia Zhu, Zheng H. Zhu This work studies the dynamics and optimal stabilization method of a partial space elevator (PSE) system with multiple climbers. All satellites and climbers are assumed as lumped masses that are connected by straight, massless, and inextensible tethers. A general dynamic model is derived for the PSE with multiple climbers. It is found different climber moving patterns of climbers have major influence of dynamic behavior of PSE. Optimal control is used to develop optimal operation modes to suppress the libration of PSE with multiple climbers. Moreover, a new operation mode is proposed to approach the desired mission objectives. It is found that all libration angles can be suppressed to zero by the end of the transfer period if two climbers can be kept at a constant speed. At the same time, the magnitudes of libration angles can be kept bounded by regulating the speed of the middle climber relative to other two climbers. Abstract: Publication date: 15 May 2019Source: Advances in Space Research, Volume 63, Issue 10Author(s): O.E. Abe, C. Paparini, R.H. Ngaya, S.M. Radicella, B. Nava, A. Kashcheyev It is a known fact that ionosphere is the largest and the least predictable among the sources of error limiting the reliability and accuracy of Global Navigation Satellite Systems (GNSS) and its regional augmentation systems like Satellite Based Augmentation System (SBAS) in a safety-of-life application. The situation becomes worse in the Equatorial Ionization Anomaly (EIA) region, where the daytime ionization distribution is modified by the fountain effect that develops a crest of electron density at around ±15° to ±20° of the magnetic equator and a trough at the magnetic equator during the local noon hours. Related to this phenomenon is the appearance of ionosphere irregularities and plasma bubbles after local sunset. These may degrade further the quality of service obtained from the GNSS/SBAS system of the said periods. Considering the present operational augmentation systems, the accuracy and integrity of the ionosphere corrections estimate decreases as the level of disturbances increases. In order to provide a correct ionosphere correction to the user of GNSS operating in African EIA region and meet the integrity requirements, a certified ionosphere correction model that accurately characterizes EIA gradient with the full capacity to over-bound the residual error will be needed. An irregularities detector and a decorrelation adaptor are essential in an algorithm usable for African sub-Saharan SBAS operation. The algorithm should be able to cater to the equatorial plasma vertical drifts, diurnal and seasonal variability of the ionosphere electron density and also should take into account the large spatial and temporal gradients in the region. This study presents the assessment of the ionosphere threat model with single and multi-layer algorithm, using modified planar fit and Kriging approaches. Abstract: Publication date: 15 May 2019Source: Advances in Space Research, Volume 63, Issue 10Author(s): T. Visser, G. March, E. Doornbos, C. de Visser, P. Visser Thermospheric wind measurements obtained from linear non-gravitational accelerations of the Gravity field and steady-state Ocean Circulation Explorer (GOCE) satellite show discrepancies when compared to ground-based measurements. In this paper the cross-wind is derived from both the linear and the angular accelerations using a newly developed iterative algorithm. The two resulting data sets are compared to test the validity of wind derived from angular accelerations and quantify the uncertainty in accelerometer-derived wind data. In general the difference is found to be less than 50 m/s vertically after high-pass filtering, and 100 m/s horizontally. A sensitivity analysis reveals that continuous thrusting is a major source of uncertainty in the torque-derived wind, as are the magnetic properties of the satellite. The energy accommodation coefficient is identified as a particularly promising parameter for improving the consistency of thermospheric cross-wind data sets in the future. The algorithm may be applied to obtain density and cross-wind from other satellite missions that lack accelerometer data, provided the attitude and orbit are known with sufficient accuracy. Abstract: Publication date: 15 May 2019Source: Advances in Space Research, Volume 63, Issue 10Author(s): A.K. Sharma, O.B. Gurav, Anindya Bose, H.P. Gaikwad, G.A. Chavan, Atanu Santra, S.S. Kamble, R.S. Vhatkar Indian Space Research Organization (ISRO) has developed an indigenous system named Indian Regional Navigation Satellite System (IRNSS) or NavIC (Navigation with Indian Constellation), that consists of 7 satellites and transmits navigation signal in L and S bands. ISRO, for validation of the system, has installed many IGS (IRNSS/GPS/SBAS) receivers scattered over the Indian region. Using preliminary data from two geographically widely separated stations over India, this paper presents the results on studies on parameters of IRNSS signal quality and discusses how these parameters may be used to study the ionospheric behavior over the Indian region. The results show the importance and advantages of using IRNSS data for such studies. Abstract: Publication date: 15 May 2019Source: Advances in Space Research, Volume 63, Issue 10Author(s): A.A. Leonov, A.M. Galper, N.P. Topchiev, A.V. Bakaldin, O.D. Dalkarov, E.A. Dzhivelikyan, A.E. Egorov, M.D. Kheymits, V.V. Mikhailov, P. Picozza, R. Sparvoli, S.I. Suchkov, Yu.T. Yurkin, V.G. Zverev The GAMMA-400 currently developing space-based gamma-ray telescope is designed to measure the gamma-ray fluxes in the energy range from ∼20 MeV to several TeV in the highly elliptic orbit (without shadowing the telescope by the Earth) continuously for a long time. The physical characteristics of the GAMMA-400 gamma-ray telescope, especially the angular and energy resolutions (at 100-GeV gamma rays they are ∼0.01° and ∼1%, respectively), allow us to consider this space-based experiment as the next step in the development of extraterrestrial high-energy gamma-ray astronomy. In this paper, a method to improve the reconstruction accuracy of incident angle for low-energy gamma rays in the GAMMA-400 space-based gamma-ray telescope is presented. The special analysis of topology of pair-conversion events in thin layers of converter was performed. Applying the energy dependence of multiple Coulomb scattering for pair components, it is possible to estimate the energies for each particle, and to use these energies as weight in the angle reconstruction procedure. To identify the unique track in each projection the imaginary curvature method is applied. It allows us to obtain significantly better angular resolution in comparison with other methods applied in current space-based experiments. When using this method for 50-MeV gamma rays the GAMMA-400 gamma-ray telescope angular resolution is about 4°. Abstract: Publication date: Available online 17 April 2019Source: Advances in Space ResearchAuthor(s): B.B. Chargeishvili, D.A. Maghradze, D.R. Japaridze, N.B. Oghrapishvili, T.G. Mdzinarishvili, K.B. Chargeishvili, B.M. Shergelashvili We studied the limb brightening of SOHO EIT daily images of the solar corona taken in 195 Å wavelength line from 1996 to 2018. Using special software, we studied the distribution of the background intensity of the entire disk in the direction of rotation (horizontally) and perpendicular to the direction of rotation (vertical). The study shows that the intensity distribution from the center to the limb of the solar disk is not polar-symmetric. A data-derived study showed that the coronal limb brightening has rather elliptical than circular isophotes. The pattern of the limb brightening correlates with the cycle of solar activity. The moving average patterns with the window of the year give good results for removing the limb brightening when preparing coronal images for further study. Abstract: Publication date: Available online 16 April 2019Source: Advances in Space ResearchAuthor(s): Mehdi Moghadasian, Jafar Roshanian An innovative aerodynamically assisted spacecraft manoeuvre strategy is introduced in this study which benefits from the higher order powers of the state variables as the feedback signal for online calculation of trajectory correction commands. The proposed manoeuvre policy is exploited from nonlinear optimal control theory formulation by incorporating a novel form of High Order Expansions method which results in an approximately optimal manoeuvre commands in practice. To extract such a manoeuvre policy, a specific approach of dealing with High Order Expansions method, namely Vectorised High Order Expansions, is illustrated comprehensively. Then, the implementation of this method is described to extract the solution of general optimal control problems by use of sensitivity variables. By means of this novel approach, the higher order manoeuvre policy is designed for the aero-assisted mission up to and including the 8th order expansions to better reveal the quality of the proposed approach. The performance of the proposed method is investigated by the means of planar point mass simulations; the results are compared with a state dependent Riccati equation method and the numerical open loop solution of the problem, and the quality of the higher order terms is investigated. Abstract: Publication date: Available online 15 April 2019Source: Advances in Space ResearchAuthor(s): Rodolfo Batista Negri, Alexander Sukhanov, Antônio Fernando Bertachini de Almeida Prado The gravity assist is a maneuver greatly applied to space missions, with the main goal of giving or removing energy of a spacecraft through a passage near a celestial body. The patched-conics approximation is the first approximation that is usually considered in the mission planning. It gives a good accuracy in the majority of the situations. However, when using the Moon for the close approach, the results have a tendency to diverge from a more complete three body dynamics. This is due to the large mass of the Moon compared to the Earth. In that sense, the goal of the present paper is to study the errors given by the patched-conics approximation in a lunar gravity assist maneuver. To find those errors we compare the results coming from this approximation with the equivalent results obtained from the circular restricted three body problem and the bi-circular restricted four body problem for a same periselenium condition. This comparison is made in the orbital elements before the maneuver and the C3 of the spacecraft after the maneuver under the three models considered. Different values for the initial conditions of the spacecraft are used to obtain general conclusions about the behavior of the errors involved. We conclude that there is a tendency to a better agreement between the patched-conics and the three body problem for retrograde transfer orbits. We also find that the effects of the Sun in the maneuver needs to be included only in more accurate steps of the mission. Abstract: Publication date: Available online 13 April 2019Source: Advances in Space ResearchAuthor(s): A.P. Trishchenko, L.D. Trichtchenko, L. Garand The study reports results of analysis related to minimization of the total ionizing dose (TID) for the Multiple Apogee Highly Elliptical Orbit with periods 14 h, 15 h and 16 h introduced earlier for continuous observation of the Earth’s polar regions. The modeling of space environment has been conducted with use of the European Space Agency’s SPENVIS tool based on the AE8/AP8 radiation models. Originally, the set of orbital parameters has been derived through the optimization process that included among other factors criteria for the apogee height limit and minimization of the radiation dose caused by trapped protons. By relaxing the apogee altitude limit, this study found the total ionizing dose TID can be significantly reduced for 15-h and 16-h orbits, while the originally proposed 14-h orbit is already at the minimum of radiation dose. For 15-h and 16-h orbits this converts into reduction of the thickness of aluminum shielding by factor 1.24-1.28 or an equivalent increase in the mission lifetime by up to 8.1 years. For example, an increase in apogee altitude to 49,620 km for 16-h orbit (eccentricity e=0.74) in comparison to the originally proposed 16-h orbit (altitude equal to 43,500 km, e=0.55) reduces the TID so that the shielding thickness decreases to 3.53 mm, instead of 4.35 mm of aluminum slab for the same 15-year duration of mission. Decrease of the TID is achieved due to significant reduction of ionizing radiation from the trapped electrons through the better placing of the orbit trajectory in the slot area, but at the expense of slight increase of ionizing radiation from the trapped protons and increase in apogee altitude to 46,640 km and 49,620 km for 15-h and 16-h orbit, correspondingly. Abstract: Publication date: Available online 11 April 2019Source: Advances in Space ResearchAuthor(s): Gabriele Bruni, Tuomas Savolainen, Jose Luis Gómez, Andrei P. Lobanov, Yuri Y. Kovalev, on behalf of the RadioAstron AGN imaging KSP teams Imaging relativistic jets in active galactic nuclei (AGN) at angular resolution significantly surpassing that of the ground-based VLBI at centimetre wavelengths is one of the key science objectives of the RadioAstron space-VLBI mission. There are three RadioAstron imaging key science programs that target both nearby radio galaxies and blazars, with one of the programs specifically focusing on polarimetry of the jets. The first images from these programs reach angular resolution of a few tens of microarcseconds and reveal unprecedented details about the jet collimation profile, magnetic field configuration, and Kelvin-Helmholtz instabilities along the flow in some of the most studied AGN (3C 84, BL Lac, 3C 273, S5 0836+710). Here we give an overview of the goals and strategy of these three ongoing programs, highlight their early results, and discuss the challenges of space-VLBI imaging. Abstract: Publication date: 1 May 2019Source: Advances in Space Research, Volume 63, Issue 9Author(s): Francesca Tesolin, Alfonso Vitti, Augusto Mazzoni, Mattia Crespi The Variometric Approach for Displacement Analysis Standalone Engine (VADASE) was successfully applied for seismological and monitoring purposes using GPS observations. In this work, GPS inter-operable and specific signals transmitted by Galileo satellites were considered to evaluate the impact of Galileo observations on VADASE solutions. The repetition period of the Galileo constellation was investigated to identify the time-windows with the most abundant number of Galileo satellites. Observation packages of about 15 min at 1 Hz were analyzed. Comparisons between the GPS derived and the Galileo derived VADASE solutions were performed after the identification of satellite configurations presenting the same number of satellites and similar geometries. Galileo and GPS combined solutions were also investigated. Single frequency and iono-free phase observations from a set of IGS-MGEX sites were processed in order to evaluate the sensitivity of the VADASE solutions with respect to a zero-displacement scenario. Galileo derived solutions are, in general, of good quality, essentially comparable to or better than the GPS derived solutions. The preliminary results enhance the contribution of Galileo system and pave also the way to a wider use of low-cost single frequency receivers for specific monitoring applications. The state of the undergoing development of the VADASE software for the combined processing of GPS and Galileo data are also presented. Abstract: Publication date: 1 May 2019Source: Advances in Space Research, Volume 63, Issue 9Author(s): Jiu-yuan Guo, Xiao-lin Zhang BeiDou Navigation Satellite System (BDS) B2 signal works in the aeronautical radio navigation services (ARNS) band. It suffers high-power pulse interference, particularly from distance measuring equipment (DME), which will affect signal acquisition, signal tracking, as well as positioning of airborne BDS receiver. Regarding the problem, a DME pulse interference mitigation algorithm based on FLOC-TDE (Fractional Lower Order Covariance-Time Delay Estimation) is proposed in this paper, which can effectively mitigate DME pulse and retain useful BDS satellite signals. We firstly analyzed the live data collected from COMAC (Commercial Aircraft Corporation of China Ltd) Airborne BDS First Flight Project. And then, experiments on COMAC airborne BDS experiment platform were performed. The proposed algorithm, time domain pulse blanking algorithm and non-mitigation algorithm were compared in the experiments. The values of correlation peak to secondary peak ratio (CPSP) and the correlation peak to mean peak ratio (CPMP), and carrier-to-noise ratio (C/N0) using the proposed algorithm were the biggest. The results verify that the proposed algorithm can mitigate DME pulse interference, improve acquisition and tracking performance of airborne BDS receiver, which can ensure the system integrity. Abstract: Publication date: 1 May 2019Source: Advances in Space Research, Volume 63, Issue 9Author(s): Yun Zhang, Wenhao Yu, Yanling Han, Zhonghua Hong, Siming Shen, Shuhu Yang, Jing Wang To investigate the static and kinematic positioning performance with the low-cost multiple Global Navigation Satellite System (GNSS) receivers is vital for the GNSS community owing to their wide civil applications. In this contribution, we developed the real-time kinematic (RTK) algorithms for low-cost GNSS receiving module to fulfil the task of the integrated RTK positioning with US Global Positioning System (GPS) and the Chinese BeiDou Navigation Satellite System (BDS). The RTK positioning performance of a low-cost module named STA8090 and a state-of-the-art module named Novatel OEM6 was compared. In our study, the virtual reference station (VRS) data stream from QianXun SI was utilized. First, one 12-h static test was performed, achieving the centimeter-level horizontal accuracy with an RMS (Root Mean Square) of less than 1 cm. Afterwards, some kinematic experiments were conducted under four different environmental scenarios, of which positioning accuracy of approximately 20 cm was obtained. The experimental results demonstrated that the RTK positioning performance with low-cost multi-GNSS module can fulfil the current navigation capability well. Abstract: Publication date: 1 May 2019Source: Advances in Space Research, Volume 63, Issue 9Author(s): C. Specht, P.S. Dabrowski, J. Pawelski, M. Specht, T. Szot One of the most popular functions of modern mobile phones is determining the coordinates of the device using built-in GNSS receivers. By using map images extensively available on the Internet, today's smartphones have become basic navigation devices of the average user.Mobile devices with built-in GNSS receivers are primarily used in land navigation. However, marine sailing, tourism and recreation are fields where the use of mobile phones as navigation devices is also very common. The average position errors of GNSS receivers mounted on smartphones decisively influence the ability and accuracy of navigation based on those devices.This publication analyses the accuracy of the dynamic positioning of six Samsung Galaxy smartphones during vessel manoeuvring. As part of the parallel tracking studies, the telephone positions were compared to those of precise GNSS receivers, using corrections from an active geodetic network with an accuracy of 2–3 cm (p = 0.95). As a result of the 4-h measurement, the accuracy statistics for each of the phone models were defined based on approximately 10,000 positions. Studies indicate that there are significant differences in the accuracy of positioning as performed by the models in question. Abstract: Publication date: 1 May 2019Source: Advances in Space Research, Volume 63, Issue 9Author(s): Zhao Li, Hua Chen, Peng Yuan The performance of Real-Time (RT) Precise Point Positioning (PPP) ambiguity resolution can be further improved by incorporating multiple Global Navigation Satellite System (GNSS) observations. RT PPP with ambiguity resolution based on raw GNSS observations, aided by the satellite clock offsets and GPS un-calibrated phase delays (UPDs), is realized to evaluate the effect of GNSS observations. Compared with previous studies, Galileo observations are integrated in this analysis and the effect of new BeiDou/Galileo systems in RT PPP ambiguity resolution is analyzed for global users. Comparing with the GPS-only and GPS/GLONASS solution, the time to first fix (TTFF) is 18.8% and 7.9% improved for those users in the Asia-Pacific regions, while it is 9.6% and 3.8% improved for other users by adding the BeiDou/Galileo observations. The improvement of the fixing rate and positioning accuracy is similar for users in different regions. The fixing rate is 2.1% and 0.5% improved when adding BeiDou/Galileo observations on top of GPS and GPS/GLONASS respectively. The accuracy of the north, east and up components are 0.4, 0.0 and 0.5 mm improved when adding on top of GPS, while 0.2, 0.1 and 0.4 mm when adding on top of GPS/GLONASS. By utilizing observations of four systems, an accuracy of 9.0, 9.1 and 28.3 mm is achieved for the fixed kinematic PPP solution after a mean initialization time of 797.9 s.
Abstract: Publication date: 1 May 2019Source: Advances in Space Research, Volume 63, Issue 9Author(s): Chunming Fan, Qinglin Guan, Zhengping Zhu, Fei Peng, Wei Xiang The Single-frequency receiver based on pseudo-range single point positioning (SPP) technology is widely used due to its advantage of low cost. As the weighted least squares (WLS) estimation in SPP is used to calculate the user’s position, optimizing weight estimation may be a strategy to improve the positioning accuracy. So far, lots of effective weighting approaches have been developed, such as satellites elevation angle, signal-to-noise ratio (SNR), measurement residual and priori-variances weighting approach. Most of these weighting approaches use one factor or more factors without considering the correlation between them to estimate the weight matrix, possibly leading to imprecise weight estimation. However, the situation in building weighting model with multiple factors and their correlation are complicated and difficult. In this study, we try to develop a new weighting approach called fuzzy weighting approach to improve the positioning accuracy. This approach adopts the fuzzy control theory to estimate the weights of the observations. It does not limit numbers of factors involving into the weight estimation and require the precise mathematic model describing the relation between factors and weight. This study presents the results of the static and kinematic experiments of pseudo-range SPP with WLS using four weighting approaches: SNR-based, elevation-dependent, combined SNR and elevation and fuzzy weighting approaches. The results show fuzzy weighting approach more effectively improves the positioning accuracy. Abstract: Publication date: 1 May 2019Source: Advances in Space Research, Volume 63, Issue 9Author(s): Yong Wang, Xiubin Zhao, Chunlei Pang, Bo Feng, Haibo Tong, Liang Zhang Attitude Dilution of Precision (ADOP) is an important indicator that reflects the relationship between attitude errors and noise in carrier phase observations for Global Navigation Satellite System (GNSS) attitude determination. Several definitions of the ADOP have been put forward by some scholars so far. However, there is no widely accepted standard ADOP definition currently. Therefore, the most exact ADOP definition need to be selected to compare the attitude determination performance of BDS and GPS stand-alone and integrated system. In this paper, three representative ADOP definitions are studied. Theoretical analysis and data simulation show that the ADOP definition proposed by Gomez is the best among these three definitions. After that, the ADOP for BDS and GPS integrated attitude determination is defined based on the ADOP-Gomez definition. BDS and GPS stand-alone and integrated ADOP are calculated in a three-antenna static attitude determination experiment. The experimental results demonstrate that the ADOP for GPS stand-alone system is on the whole lower than BDS stand-alone system, which means the geometry strength of GPS for attitude determination is stronger than BDS. Even so, the ADOP for BDS is nearly close to GPS in the condition that the visible satellite numbers of BDS and GPS are almost the same. It is also concluded that the ADOP for BDS and GPS integrated system significantly decreases compared with their stand-alone system. Abstract: Publication date: 1 May 2019Source: Advances in Space Research, Volume 63, Issue 9Author(s): Peng Lin, Guobin Chang, Jingxiang Gao, Qianxin Wang, Hefang Bian It is common in geodetic practice that station geodetic coordinates in an old frame are measured/estimated by adjusting conventional leveling and vertical networks (together with a vertical datum), whereas their Cartesian coordinates in a new frame are measured/estimated by adjusting modern 3D Global Navigation Satellite System (GNSS) networks. To estimate Helmert transformation parameters between the two frames, one can simply convert the geodetic coordinates to their Cartesian counterparts in the same frame, and then perform a least-squares transformation with Cartesian coordinates in both frames. This stepwise approach is not optimal because of nonlinearity in the first step. In this work, a direct transformation is conducted. A functional model with mixed geodetic and Cartesian measurements is followed, and a realistic stochastic model considering measurement errors in both frames is adopted. Correlations between common and non-common stations are also taken into account. Weighted least-squares estimates of the transformation parameters and transformed/adjusted coordinates in the new frame are derived in detail, the latter representing the enlarged network of the new frame. Simulations are conducted, and the results validate the superiority of the proposed method compared with the stepwise method. Abstract: Publication date: 1 May 2019Source: Advances in Space Research, Volume 63, Issue 9Author(s): Georgia Katsigianni, Sylvain Loyer, Felix Perosanz, Flavien Mercier, Radosław Zajdel, Krzysztof Sośnica Ambiguity fixing to integer numbers of the phase measurements has been proven to ameliorate the accuracy of GNSS data processing. Until now there are two strategies to achieve ambiguity resolution; by forming double differences and by using undifferenced phase measurements. In this article, the potentiality of using the latter method for fixing the phase ambiguities for the Galileo system combined with GPS measurements in a Multi-GNSS solution is proved. The integer property of the Galileo phase clocks is demonstrated. GPS and Galileo phase fixed orbit and “integer” clock products are compared to the float solutions. Both orbit overlaps and orbit validation using satellite laser ranging (SLR) validation methods showed that there is an improvement mainly in the normal and the along track direction. Abstract: Publication date: 1 May 2019Source: Advances in Space Research, Volume 63, Issue 9Author(s): Tian Zeng, Lifen Sui, Xiaolin Jia, Zhipeng Lv, Guofeng Ji, Qin Dai, Qinghua Zhang Deriving the precise satellites orbits is a prerequisite condition for global navigation satellite system (GNSS) to provide the high precision positioning service. With GPS observations from low earth orbiters (LEOs) and terrestrial tracking stations, the orbit and clock parameters of GPS and LEO satellites can be estimated by a simultaneous least squares adjustment, called the combined precise orbit determination (CPOD) method. We select GPS data from three LEOs (GRACE, HY2A and Jason-2) and 150 terrestrial stations over half-month period to investigate the improved performance for GPS orbits when LEO GPS data are included in the process of POD. With the inclusion of LEO GPS data, the improved levels of GPS orbits are analyzed for different types of LEOs and different station networks. First the effect of LEO satellite with different orbital altitude and inclination on GPS orbits is analyzed under three ground station networks. Results show that the improved differences among different LEOs can achieve at millimeter and centimeter level for global and regional station networks, respectively. Then comparative experiments of POD with/without three LEOs are designed for global well-distributed (GW), global regional (GR), Asian-overseas regional (AOR) and Asian regional (AR) station networks, including fourteen station networks. The orbit accuracy of both GPS and LEO satellites and the improved level for GPS orbits are summarized. With the inclusion of three LEOs, contributions from LEO GPS data are comparative in GW and GR cases (more than 30 stations), 3D RMS for GPS orbits improving at mm level w.r.t. corresponding ground-only POD. With 20 stations, the improved levels are 4, 11 and 31 mm in the case of GW, AOR and AR, respectively; with 10 stations, the corresponding improved levels are 16, 24 and 87 mm. The improvements in GW and AOR cases are insignificant, within 3 cm level. In the AR case, the improved level can achieve at decimeter level, while the orbit accuracy with the inclusion of three LEOs is comparative to the inclusion of 5 ground stations evenly distributed in a non-regional area (i.e. AOR case). This study is helpful for deriving the final post-products or broadcast ephemerids for GNSS satellites when considering joining LEO data into the process of orbit determination. Abstract: Publication date: 1 May 2019Source: Advances in Space Research, Volume 63, Issue 9Author(s): Lewen Zhao, Shirong Ye, Dezhong Chen With the recovery of the triple-frequency clocks using satellite time-variant inter-frequency bias (TIFB) corrections, benefits of the third frequency observable on precise point positioning (PPP) have been investigated. But numerical investigations on the effects of the third frequency observable on precise network clock and troposphere solutions are inadequate. Besides, the current strategy used to estimate satellite TIFB differs from the strategy used for IGS standard satellite clocks estimation. Considering the inconsistency of the mathematical model, current TIFB estimation method cannot be directly used to investigate the effects of the third frequency observable. Therefore, we propose a unified method to estimate satellite clocks and TIFB simultaneously. The receiver TIFB corrections are also estimated as unknowns in the new model. The effects of the third frequency observable, as well characteristics of receiver TIFB, are investigated. Numerical experiment results indicate that the averaged standard deviation of satellite clock and troposphere estimated with triple-frequency model is within 0.1 ns and 0.08 ns, respectively. Compared to the dual-frequency estimation model, a slight improvement is observed for the troposphere precision. Analysis on the characteristic of receiver TIFB demonstrates that its time series show similar tendency over days and its precision is within 0.04 ns, suggesting that the receiver TIFB is stable and small. However, ignoring the receiver TIFB will degrade the precision of L1/L2 clocks by a level of 0.015 ns. Our results thus revealed that the third frequency observable contribute minor to the improvement of network solutions. Instead, it will degrade the estimation efficiency due to the receiver TIFB parameters. Abstract: Publication date: 1 May 2019Source: Advances in Space Research, Volume 63, Issue 9Author(s): Guanwen Huang, Bobin Cui, Yan Xu, Qin Zhang The on-orbit characteristics and service performance of Galileo navigation system (Galileo) has been drawn attentions since Galileo is the only one global navigation system which is normally equipped with large-scale, high precision and performance hydrogen atomic clocks. Based on a period of 1000 days’ Galileo satellite clock offset products, this article analyzed the performance changes of Galileo satellite clocks when the working clock is switched to the backup clock. The onboard clock phases, frequencies, frequency drifts, the polynomial fitting residuals and the stabilities have been obtained. Results show that the frequency drifts of Galileo satellite clocks can reach up to a magnitude of 10−19 and the fitting precisions are superior to 0.3 ns, while the stabilities in the time length of ten thousand seconds can achieve 10−14. These mainly can be due to the onboard high performance and precision hydrogen atomic clocks. Abstract: Publication date: 1 May 2019Source: Advances in Space Research, Volume 63, Issue 9Author(s): Dongxia Wang, Rui Guo, Shenghong Xiao, Jie Xin, Tingsong Tang, Yunbin Yuan Atomic clocks are the core equipment aboard navigation satellites, and their performances and predictions directly determine PNT accuracy. In this paper, the on-orbit performances and prediction accuracies of atomic clocks used in new generation navigation satellites are evaluated using two-way time synchronization data. First, using clock error data preprocessed based on combined MAD gross error detection, the method used to evaluate satellite clock performance is studied. The results illustrate that gross error can be eliminated effectively and that the performances of the new generation of satellites are improved in comparison with those of regional satellites. The frequency accuracy has been enhanced from 6.91 × 10−12 to 3.29 × 10−12, and daily stability has been enhanced from 4.036 × 10−14 to 2.339 × 10−14. Second, a weighted combined clock error prediction model was designed that synthesizes polynomial and gray models using the classical weighted method. The results using the combined models show that the prediction accuracies of the new generation satellites are improved by a factor of two when compared with those for regional satellites, and the mean prediction was enhanced was from 0.77 ns to 0.38 ns. Moreover, from the research findings, it was found that prediction accuracy is significantly correlated with daily stability and frequency accuracy and has a micro-correlation with daily drift rate. Finally, in order to study the prediction accuracies of the new generation of satellites, we studied ISL and concluded that it has greatly increased the measured arc of the MEO satellites and can improve re-entry prediction accuracies from 3–4 ns to 1 ns. Abstract: Publication date: 1 May 2019Source: Advances in Space Research, Volume 63, Issue 9Author(s): Qianxin Wang, Kefei Zhang, Suqin Wu, Yan Zou, Chao Hu With the rapid increase in the numbers of new generation Global Navigation Satellite Systems (GNSS) satellites, signal frequencies and ground tracking stations, the burden on data processing increases significantly, especially for those real-time or near real-time applications, e.g. generating ultra-rapid satellite orbit and Earth rotation parameters (ERP) products. In order to reduce the number of observations used to estimate the orbit and ERP unknown parameters for better computational efficiency, this study first introduced a parameter called orbit and ERP dilution of precision (OEDOP) factor and a method in “optimally” selecting multi-GNSS tracking stations based on the OEDOP factor is investigated to minimize the data processing burden without significantly sacrificing the accuracy and precision of the satellite orbit and ERP determination. The trade-off between computational efficiency and quality of results is primary focus of this research. The contribution of each tracking station to the precision of the parameter estimates is investigated first, according to the location and multi-GNSS data measurement capacity of the station as well as the length of observations, then those stations that contribute least will be identified and excluded in the estimation system. It aims to use as a fewer number of tracking stations as possible but the degradation in the precision of the solution is still under a desired level. The method was tested using GNSS observations from 409 International GNSS service (IGS) stations over a one-month period. Results showed that when the “degradation” factor of the precision of satellite orbit and ERPs solutions is 5%, 10%, 15% and 20% the accuracy of the satellites orbit and polar motion parameters estimated from an optimal minimum number of stations (in comparison with the results from all stations) reduced about 0.33–9.92 cm and 5.77–41.53 μas respectively, and the accuracy of UT1–UTC reduced 10.63–15.50 μs; while their computational speed was improved by 196%, 332%, 527% and 617% respectively. This suggests that our method is a good trade-off method and an ideal option in cases that rapid solutions are required, e.g. ultra-rapid determination of orbit and ERP using multi-GNSS measurements from global ground tracking stations. Abstract: Publication date: 1 May 2019Source: Advances in Space Research, Volume 63, Issue 9Author(s): Shuli Song, Na Cheng, Hui Xie, Weili Zhou Solar activity induces ionospheric disturbances, which can reduce the performance of the Global Navigation Satellite System (GNSS). Broadcast ionospheric models (BIMs), used to correct ionospheric delay for single-frequency users, the features and performance of which under ionospheric disturbance conditions are still not understood clearly. In this study, we analyzed the adaptability of the Global Positioning System/BeiDou Navigation Satellite System (GPS/BDS) BIMs and ionospheric total electron content (TEC) anomalies over China during 12 X-class and M-class large solar flare events during the solar active period in terms of the TEC, rate of TEC (ROT), and relative accuracy. Our study showed that during the solar flare occurrence the GPS-derived TEC over China may increase up to 5.0 TECUs within minutes, whereas the ROT may exceed 0.5 TECU/min. Relative to the GPS-derived TEC and ROT, both BDS and GPS BIMs cannot response so actively to these solar flares. However, in terms of relative accuracy, the BDS BIM performed with weaker influence from solar flares due to its updating of coefficients with high frequency, though the absolute accuracy of the BDS BIM has to be improved further. Abstract: Publication date: 1 May 2019Source: Advances in Space Research, Volume 63, Issue 9Author(s): Dezhong Chen, Shirong Ye, Caijun Xu, Weiping Jiang, Shuwen Li, Pengfei Xia, Peng Jiang Due to the disturbances along the signal path, it’s inevitable that the loss of lock or data interruption interval of a few satellites reach to decades of seconds or even minutes. It will be difficult to recover data and evaluate cycle slips after a long gap in real time kinematic (RTK) positioning. A double-differenced (DD) velocity estimation method is proposed for the repair of cycle slip in RTK positioning, assuming available of fixed coordinate solutions for the previous epoch. We achieve the precise coordinate solution of the current epoch by using triple-differenced (TD) combinations. The dual-frequency observed minus computed (OMC) combinations are then calculated by using the observations and coordinate solutions. The differenced OMC values between two epochs are used to repair cycle slips. Two kinematic experiments carried out to evaluate the performance of the proposed method are for velocities less than 2 m s−1 for a boat and about 10 m s−1 for a vehicle. The averaged distance of boat and vehicle relative to the reference are about 11 km and 24.5 km, respectively. The experimental results of the boat case indicate that all cycle slips are corrected within 0.25 cycles even though sampling interval reaches to 120 s. The cycle slips fixing uncertainty is close to 0.3 cycles for a sampling interval of 30 s and 60 s vehicle experiments. As the sampling interval increases to 90 s and 120 s, the uncertainty rises to 0.35 cycles for the vehicle-dynamic vehicle experiment. Abstract: Publication date: 1 May 2019Source: Advances in Space Research, Volume 63, Issue 9Author(s): Renhu Pu, Yongliang Xiong This research presents a new algorithm to resolve real-time cycle slip for undifferenced triple frequency observations of BeiDou navigation satellite system (BDS). The method of cycle slip (CS) detection is based on three linearly independent combinations: GIF (geometry free and ionosphere free) combination, GF (geometry free) phase combination and code-phase combination. First order differenced ionospheric delay is predicted by a back moving window filter. The difference between predicted and calculate first order differenced ionospheric delay is adopted to detect the insensitive cycle slips and to judge whether the detected cycle slips are repaired correctly. With respect to cycle slip determination, modified LAMBDA (MLAMBDA) method is adopted. The proposed method has been verified by real BDS observations adding various artificial cycle slips at every ten epochs. The results show that the proposed algorithm is reliable to detect and repair small and large cycle slips even under low sampling interval (30 s). The fix rate of CS can reach 100% for all the selected satellites. For the most insensitive cycle slip group (1, 1, 1), the fixing rate can reach 99.82% without considering the first order differenced ionospheric delay condition. The fixing rate can also reach 100% when ionospheric delay condition is considered. In terms of the comparative method, the fixing rate is about 91% in according to the IGSO satellites. These results demonstrate that the proposed algorithm can detect and repair all added cycle slips even under low sampling rate at 30 s.
Abstract: Publication date: 1 May 2019Source: Advances in Space Research, Volume 63, Issue 9Author(s): Shaoshi Wu, Xiubin Zhao, Chunlei Pang, Liang Zhang, Yong Wang A realistic stochastic model is the prerequisite in global navigation satellite system (GNSS) positioning applications. Considering that Beidou satellite navigation system (BDS) consists of geostationary earth orbit (GEO), inclined geosynchronous satellite orbit (IGSO) and medium earth orbit (MEO) satellites operating in different orbits with different heights, only one model being used in stochastic modeling is probably inadequate, which is the usual case for Global Positioning System (GPS). In this contribution, a new strategy of stochastic modeling for hybrid constellation BDS precise relative positioning is proposed, namely multiple elevation-dependent models (MEDM). In MEDM, parameters of three elevation-dependent models for GEO, IGSO, MEO satellites are estimated independently. After that, variances of phase and code observations for different orbits satellites can be estimated, then the stochastic model specific for BDS can be constructed in real time. The experimental results reveal that, when MEDM is compared with the sole elevation-dependent model and the carrier-to-noise power density ratios (C/N0)-dependent model, the maximum improvements in ambiguity resolution success rates (SR) in 5, 6, 7, 8 available satellites cases are about 0.2%, 13%, 3%, 1% for B1 frequency, and 1%, 6%, 2.5%, 0.2% for B2 frequency, respectively. The overall improvements in baseline solutions by using MEDM are in millimeter or submillimeter level. Hence, MEDM is more suitable for hybrid constellation of BDS in precise relative positioning applications. Abstract: Publication date: 1 May 2019Source: Advances in Space Research, Volume 63, Issue 9Author(s): Xinyun Cao, Jiancheng Li, Shoujian Zhang, Kaifa Kuang, Kang Gao, Qingzhi Zhao, Hu Hong With the modernisation of GPS and the development of GALILEO/BDS, more satellites can transmit multi-frequency signals, which brings new opportunities and challenges for data integration in multiple systems. This work focuses on the performance of triple-frequency precise point positioning (PPP) and the phase anomaly phenomenon due to the introduction of the third frequency. First, three PPP models, particularly the triple-frequency PPP model using uncombined observations, are derived. The new biases, inter-frequency biases (IFBs), are estimated to compensate for the pseudorange hardware delays in the triple-frequency PPP model. Then the reason for the phase anomaly on the third frequency is analysed theoretically. Finally, three PPP models with real GPS/GALILEO/BDS triple-frequency data are performed to evaluate the performance of triple-frequency PPP and the influence of time-variant phase hardware delays. Due to the smaller magnitude of the time-dependent phase hardware delays for GALILEO and BDS, even regardless of them, the triple-frequency PPP model can achieve a similar or better positioning accuracy. However, this is not the case for GPS. The results show that the traditional clock products based on dual-frequency ionosphere-free (IF) combinations cannot be directly used in the GPS triple-frequency PPP because of the time-dependent part of the phase hardware delays. Ignoring the time-dependent part will cause a much poorer positioning performance compared with dual-frequency PPP. After adding a small amount of process noise to the GPS ambiguities on the third frequency, the 3D positioning accuracy of the GPS/GALILEO/BDS triple PPP model can achieve marginal improvement for both static and kinematic mode. Abstract: Publication date: 1 May 2019Source: Advances in Space Research, Volume 63, Issue 9Author(s): Wang Gao, Xiaolin Meng, Chengfa Gao, Shuguo Pan, Zhuangsheng Zhu, Yan Xia Multi-frequency carrier-phase linear combinations are greatly beneficial to improving the performance of ambiguity resolution (AR), cycle slip correction as well as precise positioning. However, as a limiting factor for further improvements in Global Navigation Satellite System (GNSS) high-precision positioning, the effect of multipath is also accentuated due to the measurement combination. In this paper, with real GPS and BDS triple-frequency observations, we analyse the influence of the carrier-phase multipath in three typical triple-frequency combinations: extra-wide-lane (EWL) combination, ionosphere estimation with ambiguity-corrected EWL/wide-lane (WL) combinations and the geometry-free and ionosphere-free (GIF) combination for narrow-lane (NL) AR. For more intuitive reflection of the influence caused by the carrier-phase multipath, zero-baseline tests with no multipath influence were carried out for comparison. The results from consecutive orbital repeat periods were also used to confirm this influence. Experiments show that for the BDS (1, 4, −5) and GPS (1, −6, 5) EWL combinations, the multipath errors could be combined with the biases of several metres in units of distance and over 0.5 cycles in units of cycles. Therefore in single-epoch EWL AR, besides the empirical precision, the bias caused by carrier-phase multipath should be also fully considered. The coefficients of the ionosphere estimation and GIF model are so large that the multipath errors are accentuated many times. Experiments results indicate that even smoothed or averaged with several hours, the errors of ionosphere estimators could be still over 10 cm; the biases of NL ambiguities with GIF model could be still over 0.5 cycles, especially for BDS GEO satellites. Abstract: Publication date: 1 May 2019Source: Advances in Space Research, Volume 63, Issue 9Author(s): Wanke Liu, Jianlong Li, Qi Zeng, Fei Guo, Renpan Wu, Xiaohong Zhang In GNSS (Global Navigation Satellite Systems) kinematic positioning, observations will be inevitably contaminated by cycle slips and gross errors, as the complex observation environment changes rapidly. These outliers will degrade the performance of classic Kalman filtering applied in GNSS kinematic resolution and eventually, the filtering may converge slowly or even diverge and thus the precision will be degraded. Therefore, a robust Kalman filter should be applied to resist the influence of these outliers that cannot be identified in the data preprocessing stage. Based on the conventional IGG (Institute of Geodesy and Geophysics) III equivalent weight method which addresses the outliers of the zero-weight segment with the same strategy, this paper proposes an improved robust Kalman filtering strategy that detects outliers by both posterior phase residuals and standardized residuals and handles the carrier-phase observation of zero-weight segment as cycle slips. In addition, to avoid unnecessary ambiguity reinitialization caused by the detected cycle slips, only when the carrier-phase observation of the same satellite is classified in the zero-weight segment over two consecutive epochs should the ambiguity be reinitialized. Experimental results of relative positioning show that the improved method can not only mitigate the influence of unexpected outliers in the Kalman filter but also improve the fixing rate of ambiguity resolution as well as the accuracy and reliability of positioning. Abstract: Publication date: 1 May 2019Source: Advances in Space Research, Volume 63, Issue 9Author(s): Hua Chen, Yugang Xiao, Weiping Jiang, Xiaohui Zhou, Hongfei Liu The rapid development of multi-GNSS (Global Navigation Satellite System) constellations has provided numerous benefits for common PNT (Positioning, Navigation and Timing) services. Generally, DD (Double Difference) observations are used in GNSS baseline processing. However, in traditional DD data processing methods, DD observations are normally not formed between different GNSS systems or the inter-system DD ambiguities are rather difficult to be resolved due to the different wavelength. As a result, DD observations are normally formed in each system or their inter-system ambiguities are left unresolved, which could not be regarded as the optimal baseline processing methods for multi-GNSS. This paper presents an improved algorithm for multi-GNSS short baseline processing where SD (Single Difference) rather than DD observations are formed between two receivers and this method is found to be equivalent to the ideal DD method with inter-system DD observations and resolved inter-system DD ambiguities. Furthermore, an average approach and linear model are proposed to isolate the receiver-dependent Uncalibrated Phase Delays (UPDs) from the SD ambiguities for CDMA (Code Division Multiple Access) and FDMA (Frequency Division Multiple Access) GNSS systems, respectively, to address ambiguity resolution. Experiments show that after removing the UPDs derived by the proposed methods, the fractional parts of the residuals for almost all ambiguities are less than 0.1 cycles for the GPS, BDS, GLONASS and Galileo systems, which confirms the validity of our UPD calibration methods. Experiments also show that the mean differences between the daily solutions derived by GAMIT and the 4-h solutions derived by the proposed SD method are approximately −0.12, −0.33, 1.04 and 0.31 cm in the north, east, up and length components, respectively. We also find that the baseline repeatability of the new SD method outperforms that of the DD method with only DD observations formed in each GNSS system by 36% and 26% in the north and up directions, respectively. These improvements are more significant in environments with poor observation conditions. An improvement of 40% and 30% in the north and up directions are, respectively, found when only 5 GPS and 4 BDS satellites are available. Therefore, more reliable and precise baselines can be derived with our new baseline processing method in multi-GNSS cases. Abstract: Publication date: 1 May 2019Source: Advances in Space Research, Volume 63, Issue 9Author(s): Lin Pan, Xiaohong Zhang, Xingxing Li, Xin Li, Cuixian Lu, Jingnan Liu, Qianxin Wang With the recent revitalization of GLONASS constellation and two newly emerging constellations of BeiDou and Galileo, multi-constellation integration has become a trend in Global Navigation Satellite System (GNSS) development. In order to provide a good indication of the positioning and navigation performance under the current GNSS constellations for the global users, the availability of four-constellation integration with GPS, GLONASS, BeiDou and Galileo should be investigated. In this study, the availability with the use of 31 GPS satellites, 24 GLONASS satellites, 18 BeiDou satellites and 11 Galileo satellites on a global scale is evaluated in terms of the number of visible satellites, the Position Dilution of Precision (PDOP) and the percentage of time span over which the position solutions can be acquired over the total time span during approximately a repeat cycle of orbits for all types of satellites. The effects of compatibility between different satellite systems on availability are discussed. In addition, datasets collected at 59 globally distributed four-system stations on 30 consecutive days are employed to fully assess the performance of four-constellation integrated dual-frequency precise point positioning (PPP), single-frequency PPP and single point positioning (SPP). The results indicate that the multi-constellation integration can significantly improve the availability and positioning accuracy. The enhancement of compatibility can also improve the availability. The availability can reflect the positioning performance. Abstract: Publication date: 1 May 2019Source: Advances in Space Research, Volume 63, Issue 9Author(s): Rui Tu, Cuixian Lu, Pengfei Zhang, Rui Zhang, Jinhai Liu, Xiaochun Lu A new BeiDou Navigation Satellite System (BDS) Real Time Kinematic (RTK) algorithm based on zero-combined observations and ionosphere constraints is developed in this study. When applying the zero-combined observations, the Double-Differenced (DD) ionospheric residuals are estimated as unknown parameters by adding the a priori information, i.e., the spatial and temporal ionosphere constraints. An experimental dataset was used to perform the validation and analysis. The results show that the proposed algorithm can precisely correct the DD atmosphere residuals, not only for the short baselines but also for the long baselines. Besides, the positioning results reveal much smaller noise and are more stable than the method of utilizing ionosphere-free combinations. A positioning accuracy of about 1–2 cm can be achieved with the BDS RTK for the baseline of 100 km. Abstract: Publication date: 1 May 2019Source: Advances in Space Research, Volume 63, Issue 9Author(s): A.O. Akala, E.O. Oyeyemi, O.A. Arowolo, P.H. Doherty This study characterizes GPS and EGNOS amplitude scintillations over the African equatorial/low-latitude region. The data set covers January–December 2013 at three stations; namely, Cape-Verde Island (Lat: 16°N, Lon: 24°W, Mag. Lat: 11°N), Dakar (Lat: 14.75°N, Lon: 17.45°W, Mag. Lat: 5.88°N) [Senegal] and Addis Ababa (Lat: 9.03°N, Lon: 38.77°W, Mag. Lat: 0.18°N) [Ethiopia]. Firstly, we investigated the seasonal variations of scintillations over the study sites. In doing this, we suppressed multipath effects on the data by imposing a 30° elevation masking on the data. Seasonally, scintillations recorded highest occurrences during equinoxes, and the least during June solstice. Secondly, we investigated scintillation occurrences at the three sites on a satellite-by-satellite basis at varying elevation and azimuthal angles. Generally, scintillations (at both low- and high-elevation angles) recorded the highest occurrences at Cape-Verde, followed by Dakar, and the least at Addis Ababa. Scintillation activities were generally localized within the northern skies of the study locations. EGNOS satellites signals scintillated at Dakar and Addis Ababa during the time intervals when GPS satellites signals experienced scintillations. Data showed that Cape-Verde is off the EGNOS geostationary satellite footprint. These results have the potentials of supporting the development of scintillation models for equatorial Africa. Furthermore, with a view to providing robust services for the African user community, the current research effort is also expected to provide value addition to GPS and EGNOS service providers and system designers. Abstract: Publication date: Available online 4 April 2019Source: Advances in Space ResearchAuthor(s): Patrick Mungufeni, Yenca Migoya-Orué, John Bosco Habarulema, Sandro M. Radicella In this study, we derived for the African region a scaling factor, RTEC to estimate equivalent Total Electron Content (TEC) observed by ground-based Global Navigation Satellite System (GNSS) receiver. The sources of TEC data used to derive RTEC include 11 International GNSS Service (IGS) stations and GNSS receiver on-board CHallenging MiniPay load (CHAMP) satellite. The computed TEC ratios from simultaneous observations of CHAMP satellite and IGS during the years 2001 - 2008 were found to minimally depend on the (i) locations of the stations, (ii) seasons, and (iii) solar activity. The average of TEC ratios for the local time intervals 09:01 - 15:00, 15:01 - 18:00, 18:01 - 24:00, and 00:01 - 09:00 were determined as 0.532, 0.561, 0.724, and 0.765 respectively. These average ratios of CHAMP TEC to Ground-based TEC were considered as RTEC. The IGS observed TEC over 4 spatially different stations that were not used in determining RTEC and TEC data measured using CHAMP satellite within vicinity of the stations that were scaled (equivalent Ground TEC) correlated highly (r⩾0.91). Moreover, the percentage of absolute differences between the equivalent Ground and IGS observed TEC over the stations that were ⩽5 TECU ranged from 64 - 84 %. Comparison of simultaneously IGS observed and equivalent Ground TEC over the 4 stations showed that the RTEC captures TEC variation with solar activity, seasons and spatially. Abstract: Publication date: Available online 3 April 2019Source: Advances in Space ResearchAuthor(s): Hongru Chen, Jiangkai Liu, Long Long, Zhenyu Xu, Yazhe Meng, Hao Zhang For explorations of the far side of the Moon, it is necessary to tackle the challenge of navigation and communication as the far side is invisible to the Earth. This paper proposes a low-cost mission concept that consists of four CubeSats in an Earth-Moon L2 (EML2) halo orbit. The mission objective is to provide real-time positioning service for lunar far-side assets, taking advantage of the visibility of EML2 halo orbits to both the Earth and lunar far side. Being miniature, CubeSats can be carried by a mother spacecraft and deployed during the mid-course. As CubeSat missions are generally constrained by limited communication, power, and propulsion capacities, this paper presents a feasibility study that takes into account the high-fidelity dynamical environment and system constraints. This paper analyzes the positioning performance in terms of accuracy, and spatial and temporal coverage. In addition, the requirement of deployment in terms of Δv budget and thrust magnitude is also investigated. Results show that 1) a positioning accuracy of 2.7 km is achievable; and 2) several state-of-the-art propulsion systems can meet the requirement of deployment and the stationkeeping for an acceptable duration. Abstract: Publication date: Available online 3 April 2019Source: Advances in Space ResearchAuthor(s): Daniel Landskron, Johannes Böhm Exact knowledge of the angle of Earth rotation UT1 with respect to coordinated time UTC, dUT1, is essential for all space geodetic techniques. The only technique which is capable of determining dUT1 is Very Long Baseline Interferometry (VLBI). So-called Intensive VLBI sessions are performed on a daily basis in order to provide dUT1. Due to the reduced geometry of Intensive sessions, there is however no possibility to estimate tropospheric gradients from the observations, which limits the accuracy of the resulting dUT1 significantly. This paper deals with introducing the information on azimuthal asymmetry from external sources, thus attempting to improve the dUT1 estimates. We use the discrete horizontal gradients GRAD and the empirical horizontal gradients GPT3 as well as ray-traced delays from the VieVS ray-tracer for this purpose, which can all be downloaded from the VMF server of TU Wien (http://vmf.geo.tuwien.ac.at). The results show that this strategy indeed improves the dUT1 estimates when compared to reference values from multi-station VLBI stations, namely by up to 15%. When converted to length-of-day (LOD), the estimates can be compared to LODs from global analyses of Global Navigation Satellite Systems (GNSS). Here, the improvement amounts to up to 7% compared to neglecting a priori information on azimuthal asymmetry. Abstract: Publication date: Available online 3 April 2019Source: Advances in Space ResearchAuthor(s): Vincent L. Fish, Maura Shea, Kazunori Akiyama Very long baseline interferometry (VLBI) from the ground at millimeter wavelengths can resolve the black hole shadow around two supermassive black holes, Sagittarius A∗ and M87. The addition of modest telescopes in space would allow the combined array to produce higher-resolution, higher-fidelity images of these and other sources. This paper explores the potential benefits of adding orbital elements to the Event Horizon Telescope. We reconstruct model images using simulated data from arrays including telescopes in different orbits. We find that an array including one telescope near geostationary orbit and one in a high-inclination medium Earth of geosynchronous orbit can succesfully produce high-fidelity images capable of resolving shadows as small as 3μas in diameter. One such key source, the Sombrero Galaxy, may be important to address questions regarding why some black holes launch powerful jets while others do not. Meanwhile, higher-resolution imaging of the substructure of M87 may clarify how jets are launched in the first place. The extra resolution provided by space VLBI will also improve studies of the collimation of jets from active galactic nuclei. Abstract: Publication date: Available online 1 April 2019Source: Advances in Space ResearchAuthor(s): Rui Zhang, Rui Tu, Jinhai Liu, Ju Hong, Lihong Fan, Pengfei Zhang, Xiaochun Lu As one of the major global navigation satellite systems (GNSSs), the performance of the Galileo Satellite Navigation System (Galileo) has been of pressing concern. By the end of June 2018, there were 17 operational satellites that provide navigation and positioning services. However, there is little research evaluating the performance of the Galileo single-system in terms of the average satellite coverage and precise positioning. To address this, this study firstly uses the number of visible satellites to analyze the global average satellite coverage of Galileo. Then different data processing strategies are used to evaluate the accuracy of the Galileo satellite orbit and clock. Finally, the performances of precise point positioning (PPP) and baseline solutions obtained using the Galileo single-system are analyzed. Results show that the number of visible Galileo satellites globally is between 6 and 7 and the time percentage where the number of visible Galileo satellites is greater than or equal to 4 is more than 90% globally. For the orbit determination of Galileo satellites, the Galileo/GPS combined solution is better than that of the Galileo single-system. Using the GeoForschungsZentrum Potsdam (GFZ) multi-GNSS orbit product (indicated by GBM) as a reference, the root mean squares (RMSs) of three-dimension and radial component of Galileo/GPS three-day combined solution are 4.4 cm and 1.8 cm, respectively. The accuracy of the Galileo/GPS single-day combined solution is almost the same as that of the Galileo/GPS three-day combined solution. For the Galileo satellite clock, the Galileo/GPS combined solution provides a better result than the Galileo single-system solution. The convergence times of the static and kinematic PPP solutions of the Galileo single-system are both about 2 hours. The average the RMSs of the east (E), north (N), and up (U) components of the static Galileo-only PPP solution are 1.9 cm, 0.5 cm, and 2.0 cm, respectively. Those of the kinematic Galileo-only PPP solution are 2.1 cm, 1.4 cm, and 2.6 cm, respectively. Moreover, the baseline solution accuracy of the ultra-short baseline (48 m) of the Galileo single-system is comparable to GPS. For both static and kinematic solutions, the standard deviations (STDs) of the horizontal and vertical components are better than 6 mm and 8 mm, respectively. The accuracy of baseline solution results of the short baseline (1850 m) is poorer. For both static and kinematic solutions, the STDs of the horizontal and vertical components are better than 1.3 cm and 1.9 cm, respectively. Abstract: Publication date: Available online 1 April 2019Source: Advances in Space ResearchAuthor(s): Kanika Garg, M. Reza Emami The ascent prediction of high-altitude zero-pressure stratospheric balloons is an important aspect of targeted test flight. Prediction of the balloon ascent rate is the prerequisite for many of the flights as it helps in planning ballasting and valving manoeuvres. In this paper, a standard analytical model, a fuzzy model and a statistical regression model are developed and compared to predict the zero-pressure balloon ascent. The flight data is extracted from the Esrange balloon service system for zero-pressure balloons with different payload capability, and several potential explanatory variables are computed for every sampled climbed segment. For the fuzzy modelling approach, a fuzzy c-mean clustering algorithm is used for system identification and prediction. For the regression approach, a Gaussian process regression is used, and principal component analysis is applied for finding the significant inputs. The result shows that the data driven approaches are more efficient than the standard analytical model. Abstract: Publication date: Available online 1 April 2019Source: Advances in Space ResearchAuthor(s): S. Sadeghi, M.R. Emami It is generally believed that the heart of the Auroral Acceleration Region (AAR) is located between 5000 and 8000 km altitude above the auroral oval. Various altitude distribution profiles are suggested by different theories, including the transition layer model, which predicts that the strongest electric fields can be found at about 1 RE, and can vary depending on the plasma and geomagnetic conditions. However, there have been no specific experimental results that cover regions both below and well above such altitude. This paper presents a method for obtaining such a profile from AAR satellite crossings, applies it to a data set gathered from 116 Cluster spacecraft encounters with acceleration potential structures, and discusses the results. The crossings cover an altitude range between 0.63 RE and 2.9 RE. The outcome is the first empirical altitude distribution profile of the auroral acceleration potentials. The results suggest that the region within the altitude range of 0.9245 RE and 1.158 RE statistically contains 30% of the total potential, which is the largest fraction of the parallel potentials among all altitude segments of the same size. The altitude which equally divides the distribution of acceleration potentials was found at 1.076 RE (6863km). The obtained parallel potential distribution is in agreement with both the magnetic mirror force theory and the transition layer model, and can hence provide a proper baseline for future missions to the AAR. Abstract: Publication date: Available online 30 March 2019Source: Advances in Space ResearchAuthor(s): Tao An, Xiaoyu Hong, Weimin Zheng, Shuhua Ye, Zhihan Qian, Li Fu, Quan Guo, Sumit Jaiswal, Dali Kong, Baoqiang Lao, Lei Liu, Qinghui Liu, Weijia Lü, Prashanth Mohan, Zhiqiang Shen, Guangli Wang, Fang Wu, Xiaocong Wu, Juan Zhang, Zhongli Zhang Space Very Long Baseline Interferometry (VLBI) has unique applications in high-resolution imaging of fine structure of astronomical objects and high-precision astrometry, owing to the key long space-Earth or space-space baselines beyond the Earth’s diameter. China has been actively involved in the development of space VLBI in recent years. This paper briefly summarizes China’s research progress in space VLBI and the development plan in future. Abstract: Publication date: Available online 28 March 2019Source: Advances in Space ResearchAuthor(s): Susan W. Samwel, Esraa A. El-Aziz, Henry B. Garrett, Ahmed A. Hady, Makram Ibrahim, Magdy Y. Amin The trend towards the development of small satellites, or smallsats, has been increasing over the last few years. However, the harsh space radiation environment in which these smallsats operate provides a challenge to their survivability as their desired mission lengths increase from a few months to several years also. Smallsats typically use commercial off the shelf components (COTS) that are built for ground operations, not space use. Therefore, they may be more susceptible to the hazards of space radiation than traditional spacecraft which are typically designed to withstand the high radiation levels of space. 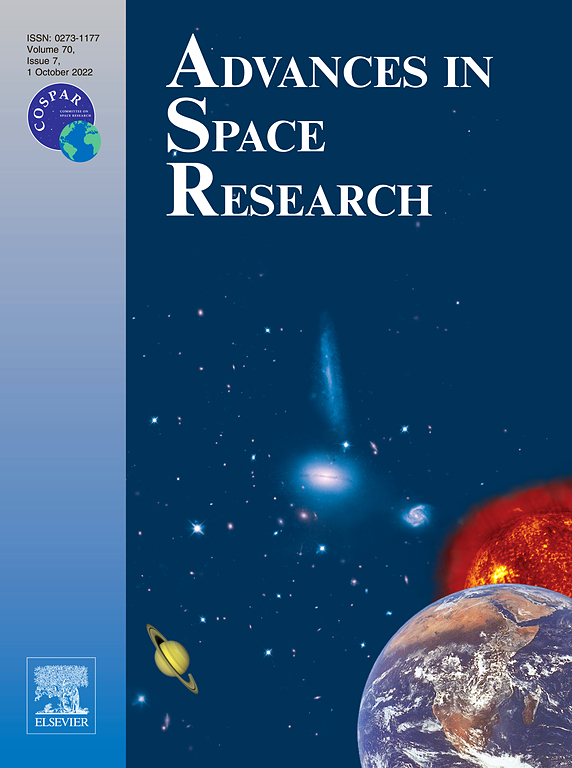 The present paper provides a targeted assessment of representative COTS components using up to date models of the space radiation environment and its effects on smallsats in a polar Low Earth Orbit (LEO). This orbit will be assumed to be sunsynchronous (98.5° inclination) and at an altitude of 800km. We employed the new Solar Accumulated and Peak Proton and Heavy Ion Radiation Environment (SAPPHIRE) model which has been released recently in 2018, ISO-15390 GCR model, and AP8/AE8 models to estimate the space radiation environment for solar particles, galactic cosmic rays (GCRs), and trapped protons and electrons respectively. The basic damage effects that can be produced in materials and electronics in this orbit due to their exposure to the space radiation are evaluated. These effects are the Total Ionizing Dose (TID), Displacement Damage Dose (DDD), and Single Event Effects (SEE) as represented by Single Event Upsets (SEUs). SEU is evaluated for different COTS components which are believed to be representative of an optimum blend of capability and cost-effectiveness for the next generation of smallsats, including 20 nm Xilinx Kintex Ultra Scale FPGA Configuration RAM (XCKU040), 90-nm SRAM, and MLC NAND flash memory (MT29F128G08CBECBH6). For comparative purposes, the analyses are performed for both maximum and minimum solar activity.Based on these comparisons, we find as expected that the space radiation environment parameters vary with solar activity. The fluence of trapped electrons and solar protons at solar maximum are higher than those at solar minimum in contrast to the trapped protons and galactic cosmic rays at low altitudes. On the other hand, TID, DDD, and SEE all show higher values during maximum solar activity than during minimum solar activity.The use of shielding material for small satellites is mandatory for this orbit as observed TID, DDD, and SEES levels that can be reached are potentially of concern to designers. However, using Al shielding thickness of at least 1.5 mm can reduce the radiation effects to acceptable levels, for both maximum and minimum solar activity for missions of moderate (∼3 years) duration. Abstract: Publication date: Available online 28 March 2019Source: Advances in Space ResearchAuthor(s): A. Mahmoudian, A. Senior, M. Kosch, W.A. Scales, M.T. Rietveld, B. Isham, X. Shi, M. Ruohoniemi Electromagnetic (EM) and electrostatic (ES) emissions can be generated in the ionosphere by high-power high-frequency (HF) radio waves transmitted from the ground. The signatures of the EM emissions observed on the ground are known as Stimulated Electromagnetic Emissions (SEE) and can be employed for remote measurement of ionospheric parameters. The experimental data from recent HF heating experiments near the fourth electron gyro-frequency (4fce) at EISCAT are presented. This paper compares the temporal behavior of SEE within a few Hertz up to 50 kHz of the transmission frequency to the time evolution of enhanced ion line (EHIL) in the incoherent scatter radar (ISR) spectrum. The correlation of Wideband SEE (WSEE) spectral lines within 1 kHz to 100 kHz such as the downshifted maximum (DM), downshifted peak (DP), and broad upshifted maximum (BUM), with HF enhanced ion lines (EHIL) is shown. It is shown that WSEE spectral lines can be used to reproduce the EHIL characteristics including altitude range, rise and decay time, maximum and minimum amplitude. A data reduction technique is developed to derive ionospheric parameters such as the electron density profile near the interaction altitude, magnetic field strength B0 as well as the altitude profile of the EHIL using the temporal evolution of WSEE spectral lines near nfce. Abstract: Publication date: Available online 28 March 2019Source: Advances in Space ResearchAuthor(s): S. Veretenenko, M. Ogurtsov In this work we continue studying possible reasons for temporal variability observed in correlation links between characteristics of the lower atmosphere and solar activity phenomena at the multi-decadal time scale. Temporal variations of correlation coefficients between troposphere pressure at extratropical latitudes and sunspot numbers are compared with the evolution of the large-scale circulation forms according to the Vangengeim-Girs classification, as well as the characteristics of the stratospheric polar vortex and global temperature anomalies. The results obtained show that temporal variability of solar activity/galactic cosmic ray (SA/GCR) effects on troposphere pressure (the development of extratropical baric systems) is characterized by a roughly 60-year periodicity and closely related to changes in the regime of large-scale circulation which accompany transitions between the different states of the polar vortex. It was suggested that the character of SA/GCR effects depends on the polar vortex strength influencing the troposphere-stratosphere coupling. It was shown that the evolution of the polar vortex may be associated with global temperature variations, with a possible reason for these variations being long-term changes of total solar irradiance. Abstract: Publication date: Available online 28 March 2019Source: Advances in Space ResearchAuthor(s): Weiwei Xu The precise AMS data reveals distinctive properties of cosmic-ray positron and electron fluxes. The positron spectrum hardens starting from ∼20 GeV. Most importantly, the positron spectrum exhibits a sharp drop-off at ∼300 GeV, showing the existence of an energy cutoff at highest energy. The electron spectrum is distinctly different from the positron spectrum in both the magnitude and energy dependence. The electron spectrum hardens from ∼30 GeV. Remarkably, the electron spectrum is well described by a single power law from 55 GeV to 1 TeV and does not have an energy cutoff. These experimental data show that, at high energies, the cosmic-ray positrons predominately originate either from dark matter annihilation or from a new astrophysical source, whereas the cosmic-ray electrons originate from different sources. Abstract: Publication date: Available online 27 March 2019Source: Advances in Space ResearchAuthor(s): Hassan Aboelkhair, Mostafa Morsy, Gamal El Afandi The climatic reanalysis datasets are one of the most important data types that could help to overcome scarce of observations. Therefore, the main objective of this study is to evaluate NASA POWER reanalysis data for surface monthly average temperatures at 2 meter (maximum (Tmax), minimum (Tmin), mean (Tmean) and dew point (Td), all in °C) and relative humidity (RH) in percentage compared to the observed data at 20 Egyptian weather stations. The results showed that there are a significant correlation and goodness of fit between NASA POWER reanalysis and observed data for all parameters except RH. For temperature variables, the coefficient of determination (R2) and Willmott Index of agreement (WI) attain around 0.75 and 0.90 respectively, while the root mean square error (RMSE) reaches to less than 5°C; and the mean bias error (MBE) ranges from -3 to +3°C for 85% of stations. In addition, NASA POWER accuracy of temperature parameters increases gradually northward with the highest ratio at the northern coast of Egypt. Where, it is slightly overestimated (under 3°C) Tmax, Tmin, and Tmean at 80, 75 and 65% of the stations respectively. While it is slightly underestimated Td with 3°C at 90% of the stations. Contrarily, NASA POWER data accuracy of RH increases southward, particularly in Aswan. Additionally, NASA POWER reanalysis has a considerable underestimation for RH data at most stations, where the dominant MBE percentage ranges from -12 to -5% for about 75% of the stations. As well as, the maximum RMSE and MBE for all elements were recorded in the Malwi station at Middle Egypt. Consequently, R2, WI, RMSE, and MBE for temperature parameters are almost within an acceptable range for most selected Egyptian stations which are located in the area that dominated by the influence of the Mediterranean Sea (northern of 30° N) and western of 30° E with a distance between 2.5 and 14.5 km from the Sea. While, the good RH estimation is recorded at stations that are located south of the area that dominated by the influence of the Mediterranean Sea (south of 26° N). Finally, NASA POWER reanalysis datasets can be used in case of missing or scarce of observations in Egypt. Nevertheless, it still needs improvements by taking into consideration the influence of the Mediterranean Sea and the locality of (especially middle) Egypt on temperature and in particular on relative humidity estimations. Abstract: Publication date: Available online 27 March 2019Source: Advances in Space ResearchAuthor(s): Stefan Frey, Camilla Colombo, Stijn Lemmens Numerical integration of orbit trajectories for a large number of initial conditions and for long time spans is computationally expensive. Semi-analytical methods were developed to reduce the computational burden. An elegant and widely used method of semi-analytically integrating trajectories of objects subject to atmospheric drag was proposed by King-Hele (KH). However, the analytical KH contraction method relies on the assumption that the atmosphere density decays strictly exponentially with altitude. If the actual density profile does not satisfy the assumption of a fixed scale height, as is the case for Earth’s atmosphere, the KH method introduces potentially large errors for non-circular orbit configurations.In this work, the KH method is extended to account for such errors by using a newly introduced atmosphere model derivative. By superimposing exponentially decaying partial atmospheres, the superimposed KH method can be applied accurately while considering more complex density profiles. The KH method is further refined by deriving higher order terms during the series expansion. A variable boundary condition to choose the appropriate eccentricity regime, based on the series truncation errors, is introduced. The accuracy of the extended analytical contraction method is shown to be comparable to numerical Gauss-Legendre quadrature. Propagation using the proposed method compares well against non-averaged integration of the dynamics, while the computational load remains very low. Abstract: Publication date: Available online 27 March 2019Source: Advances in Space ResearchAuthor(s): Russell P. Patera The recently developed Vector Inertia Tensor Attitude Estimation, VITAE, method is enhanced by the addition of two different preprocessing algorithms that modify the observation vectors prior to attitude estimation. The first preprocessing algorithm is for use in cases that have one observation vector that is much more accurate than the other observation vectors. Such cases suffer numerical error caused by the large relative weight of the very accurate observation vector. Use of the preprocessing algorithm eliminates large variation in vector weights and resulting numerical error. The second preprocessing algorithm enables VITAE to generate results equivalent to a very accurate suboptimal attitude determination algorithm that produces results extremely close to the optimum solution. Preprocessing algorithms eliminate the need to select observation vector weights to remove eigenvalue degeneracy and allows the weights to be based solely on optimality, thereby improving estimation accuracy. When optimum weights are used, the inertia matrix is recognized as the information matrix, which links VITAE to other attitude estimation algorithms. The preprocessing algorithms used with VITAE were able to uncover erroneous results in a few published test cases. The VITAE solutions were validated analytically, through the inertia matrix’s inverse relationship to the error covariance matrix. A loss function comparison is also included to further validate the preprocessing algorithms and related VITAE solution. Abstract: Publication date: Available online 25 March 2019Source: Advances in Space ResearchAuthor(s): Pouria Razzaghi, Ehab Al Khatib, Shide Bakhtiari Since space debris is a problem that has been continuously increasing, removal missions should be considered. Tethered space system (TSS) has wide application prospects in the future on-orbit missions such as debris removal. However, it is rather complex and difficult for TSS to realize stabilization of tumbling combinations after connecting to the debris. In this paper, the stabilization problem of this combination is studied.An adaptive sliding mode and State-Dependent Riccati Equation control methods are applied on a TSS to stabilize the system and de-orbit the space debris. The tether tension and stability of the in-plane and out-of-plane libration angles of the system are taken into account. The tether can only resist axial stretching. The thrusters, which are the sources of the system inputs are equipped on the satellite. The controllers regulate the tether to remain fully stretched and to decrease the altitude of the orbit continuously. The numerical simulation validates the proposed control schemes for de-orbiting the debris and put it in lower altitude orbit. This makes the debris retrieve to the atmosphere in less time than the actual orbit lifetime. The comparison between two control schemes is discussed.